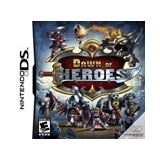 Dawn of Heros for Nintendo DS...Dawn of Heroes features classic RPG concepts, character development, epic combat, quests, and puzzle solving. Dawn of Heroes differs from other RPGs, thanks to its wide-appealing light and funny style, customizable parties, variety of dungeons and items, and multiplayer features geared toward building a community of heroes all over the world. Take in breathtaking 3D graphics, from the massive world of Brimthule to the unique look of all its inhabitants; Immerse yourself in a storyline and adventure through this massive world full of quests and dangers; Play over 50 playable missions with branching paths, side quests, and hidden side quests; Choose from over 25 playable classes from 6 unique factions to create your own party of heroes to work as the ultimate team; Face a multitude of enemies from 12 unique factions; Collect hundreds of items during your adventure; Awesome multiplayer action has players constantly optimizing their parties for a different battle every time they seek a new challenge; The streamlined user interface allows players to command all aspects of their adventure using the Touch Screen and stylus. Take in breathtaking 3D graphics, from the massive world of Brimthule to the unique look of all its inhabitants. Immerse yourself in a deep storyline as you experience multiple quests and dangers. Play more than 50 missions with branching paths and side quests. Over 25 playable classes from 6 unique factions let you create your own party of heroes to work together as the ultimate team. Face a multitude of enemies from 12 unique factions. Streamlined user interface allows players to command all aspects of their adventure using the touch screen and stylus.